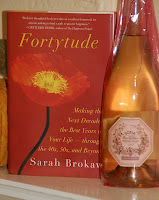 At BlogHer 2011 I was invited to attend a special talk with Sarah Brokaw, author of Fortytude. I didn't expect to gain new insight into my own life, as 40 still feels like a long way off. But what became clear as I began reading the book a few days after hearing the author speak is that Fortytude is less about turning 40 or 50 or 60, as the subtitle implies, and more about preparing for those major, inevitable transitions in life that we are guaranteed to experience. Whether it's the loss of a loved one, or a battle with cancer, or an epic career challenge, Brokaw advises that a woman's grace, connectedness, accomplishments, sense of adventure, and spirituality will see her through difficult times. The women Brokaw has interviewed for this book share a message in their stories that will resonate with women as young as 21 and as old as 101. At the heart of each of their experiences is the importance of seeing the big picture during difficult times and not getting so caught up in your own problems that you lose sight of what matters. I love Brokaw's upbeat writing and honest attempt (and success) to the perspective of women from all walks of life. I choose a sparkling wine to pair with this book because of Brokaw's discussion of the "sparkling moments" in life. These are moments when a woman decides to approach her "problem" with fresh eyes, a new attitude, and a positive outlook. And what helps with all of that in my opinion? Bubbly! This particular champagne stood out for me for a thematic reason: its pink wrapper. With the female-centric nature of the book, a champagne with a loud feminine angle seemed like the obvious choice. Enjoy.